This is a little tale of snobs and snobbery. Maybe not so little; certainly not so short, and so I crave your patience. Indulge me and be rewarded, I swear. 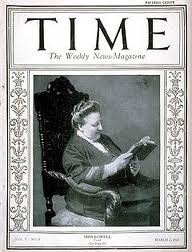 Late honors: In 1925 Lowell was the first poet on the cover of TIME. She died a few weeks later and won the Pulitzer Prize the next year. Her family’s later poets are Robert and James Russell Lowell. Unfortunately, I couldn’t find an image in which Amy is, as they say, smokin’. FYI, this and other TIME covers are available at timecoverstore.com. 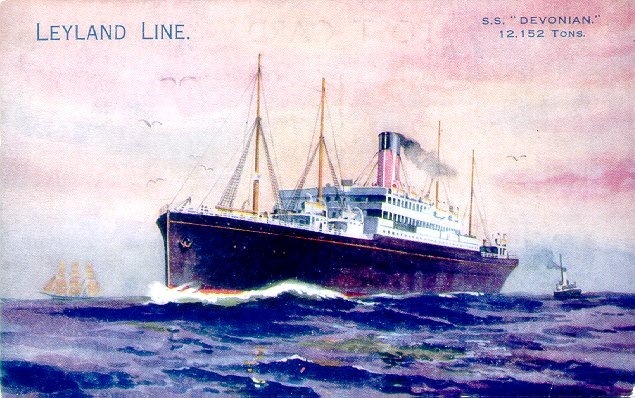 Toff travel, from Boston, anyway, a century ago. The Devonian was but a mere plodder; no ocean greyhound she! Sedately riding the foaming wave at 15 knots, she could get across ‘the Pond’ in a restful eight days or so. For that; for enlivening American poetry; for her heroic and entertaining presence Madam Lowell gets a pass on her snobbery. Wine snobs, on the other hand? No way, Gamay. Two such creatures, Gerry and John, bodied forth recently during an online discussion ignited by Unlucky Pierre, an importer who had the temerity to ask whether French wines would sell better in the U.S. if producers noted the grape varieties or blends on their front or back labels. Gerry, a public-relations executive, stuffily said that it wouldn’t be of much help because ‘Consumers who don’t know which grape is used to make bourgogne rouge probably wouldn’t buy it, anyway.’ The logic has a certain leaden brilliance: if you don’t buy it not knowing what it’s made of, you won’t buy it if you do. Got that? No one who chanced to start with Oregon Pinots and then tried a few from California and then even New Zealand would, upon seeing the words Pinot noir on a French label, decide to give it a try. Truly. Take Gerry’s word for it. Please. Heavens to Betsy, Thirsty Reader! It had never occurred to oblivious me that informing consumers would be so foul a deed, such that Camille Pissarro would have included it in his series of Turpitudes Sociales. 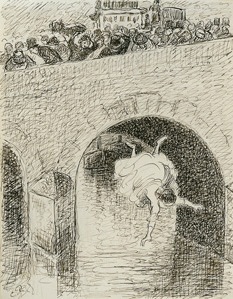 Under that title Pissarro drew images of ‘social disgraces’ to instruct his nieces on the horrors of contemporary society. 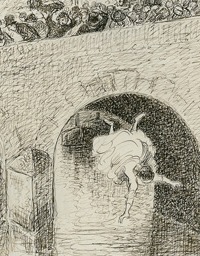 That was in 1889, but the series may still have some relevance today, as the following pictures suggest. Still, I wonder whether righteous Gerry realizes he’s hoist with his own petard. For example, should one of his Burgundies suddenly appear with the notation ‘100% Pinot Noir Grapes’ on the label, Gerry has but two courses of action open to him, neither especially attractive: He can stop drinking that wine and be a fool or continue drinking it and be a hypocrite. John’s logic is surreal. 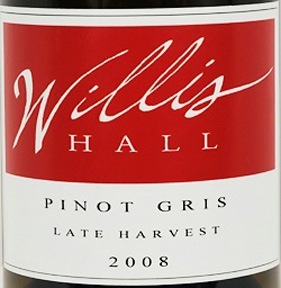 Knowing the variety, he says, is ‘probably of only secondary importance to the region of origin and the pedigree (classification) of the wine, because knowledgeable wine aficionados already know the grape varieties . . . . ‘ Think about that for just a minute, please: if they already know the varieties, that’s because the varieties are of primary importance. Growing more choleric by the syllable, he rambles on: ‘Ideally, [grape variety] would be placed so that little or no extra effort would be required to access it, meaning that the [front] label should have this information. But [this] label is usually the work of paper art dearly paid for by the winery to entice buyers to purchase their liquid art. For my winery, I insist on having a clean, distinctive display label. I place all blending and other information on the [back] label for that reason . . . ‘ Really? Damned if I know whose labels he’s been looking at, but they can’t possibly include his own. This is one of John’s front labels. 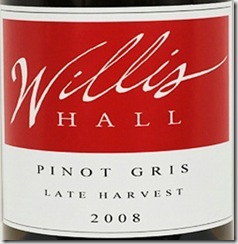 The name of a grape variety seems to have crept onto it, in plain sight, but doubtless without his knowing. This one-man shouting match suggests that John has become just a little unhinged, and it obscures Pierre’s simple question, which was: Might French wines sell better with varietal labeling? Got that? Seems like a plain yes-or-no question to me. Brand identity was never in question and multiple label styles were not mooted, Thirsty Reader. “Big thing” labels? What the hell is he talking about? In any event, he’s certain ‘people are getting tired of them,’ whatever they may be, and he won’t put details on his label because he knows people won’t read them. Smugness to such a degree almost rises to the status of an achievement. Who benefits from such self-important nonsense? Is it truly pandering, or selling out, or dishonorable to announce what grape or grapes a wine is made of? Are they who ask for such basic information mere masses, presumably unwashed? The lowest common denominator? Would you like to sit down to dinner with Gerry and John? In sum, snobbery is cheap, easy, vulgar. It is unworthy. 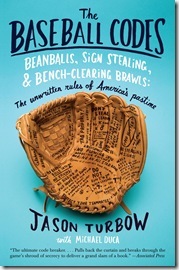 It brings to my mind The Baseball Codes, a book of etiquette. These are the unwritten rules of the game and though they be informal and handed-down they are violated at peril. 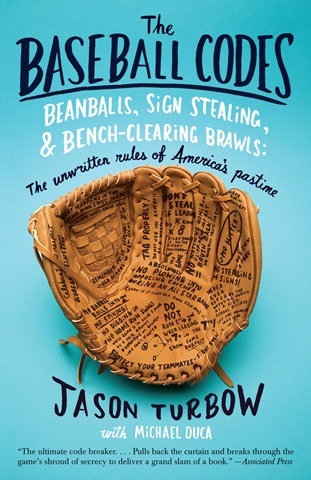 Buy the book by all means, fans, but for now consider the neat summary of it by the ex-major leaguer Bob Brenly: “I can break it down into three simple things,” he told Jason Turbow and Michael Duca, the authors. Respect your teammates, respect your opponents, respect the game.” Wine snobs take note; members of the U.S. Congress, likewise. 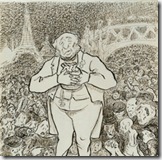 And Pissaro? What of him? 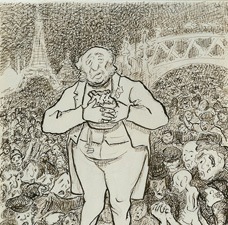 Well, he is the focus of the exhibition Pissaro’s People at the Clark Art Institute in Williamstown, Mass., through Oct. 2. It isn’t nearly so gloomy as the drawings here suggest. Technorati Tags: Amy Lowell,Imagists,Amygists,S.S. Devonian,Ezra Pound,Yankee Brahmins,Cabots,snobs,Camille Pissarro,Ambrose Bierce,Turpitudes Sociales,Clark Art Institute,The Baseball Codes. Bravo, Bill! Shame that there isn’t an extant photo of Lowell with stogy in hand, but isn’t that why PhotoShop exists? 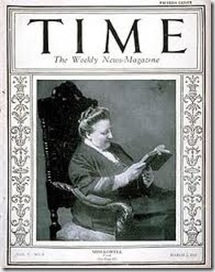 Loved hearing about the cigar-chomping lesbian poetess, who was related to Robert and James–and who made it to the cover of Time Magazine! Also, I was nonplussed at the use of “paramount” in an adverbial form. And your well reasoned, logical arguments for varietal labeling are difficult to refute. Long live the voice of reason! P.S. Do you know how I can link your blog to my website? Hilarious, instructive, cautionary! The temptation oenophile snobs might have to deride the grubby hoi polloi ought to be tempered with a read of your piece, lest they end up corked!